1. Will Catalonia's independence vote even happen? Amazingly, the biggest question about Catalonia's independence vote is, "Will it even happen at all?" Catalonia's government insists that it will, and Spain's national government insists that it won't. The Spanish government in Madrid has sent thousands of police to arrest organizers, confiscate ballots and ballot boxes, and close up polling stations, with local courts ordering Catalan police to help ("Catalan" is what you call someone from Catalonia). Meanwhile, In what the New York Times described as a "game of cat and mouse", Catalonia's government and supporters have directly resisted the police by hiding backup ballot boxes, printing new ballots, and occupying polling sites before police can take over. It's still too early to predict how things will go, but it seems likely voter turnout will be lower than planned, to say the least, and that the vote will be disorganized enough for its opponents to claim the results aren't valid. 2. Will Catalonia's people vote YES on independence? Supporters of Catalan independence have been all over the news in recent days, but that doesn't mean everyone in Catalonia agrees. In fact, many opinion polls show a majority against independence (but a large majority in favor of having a vote). Still, supporters of independence are more likely to vote than opponents, and YES could still take the day, especially now that the police have made voting difficult. But as far as we can say now, it could end up going either way. 3. If the result is YES, will Catalonia declare independence? This one is a little easier to answer: Carles Puigdemont, the leader of Catalonia's regional government, has promised to declare independence within 48 hours if the people vote YES - no matter how few voters show up. So unless the result is NO (possible), Catalonia's government is removed from power (also possible), or someone convinces them to break the promise (less likely), we can expect a Catalan declaration of independence on Tuesday. 4. Will Spain let Catalonia go if it declares independence? The obvious answer would seem to be "no", since Spain's central government has opposed the referendum at every turn, and seems desperate not to let Catalonia secede. And it certainly won't be easy - to start with, Catalonia's government would have to figure out how to get all the Spain-loyal police out. But it's also hard to say what would happen if Catalonia, and its millions of people, force the issue and try to block Spain's government from the region. Spain's current government may never give in and accept it, but another major Spanish political party has been relatively supportive of Catalans' desire to vote, and Catalonia is to large and wealthy for its neighbors to ignore. So it's not inconceivable that a solution could be hammered out in the longer-term future. 5. Would Catalonia be accepted as a country by the rest of the world? Most lists of the world's countries only include ones that have been accepted by the United Nations (UN), or at least recognized by most of the world. So if Catalonia declares independence, will it make the grade? If it could somehow work out a deal with Spain accepting secession, then the world would almost certainly accept it (like what happened with South Sudan in 2011). But if the Catalan government declares independence without Spain's permission, as it says it will Tuesday if the vote passes, then there could be a long, difficult road ahead. One of the best-case scenarios for Catalonia would be a situation something like Kosovo's or Palestine's - recognized by half of the world's countries, with only partial participation in the UN and other international organizations. But even Kosovo and Palestine had something going for them that Catalonia doesn't - the US and allies supported Kosovo's independence from the beginning, and Palestine had guaranteed support from neighboring Arab countries. 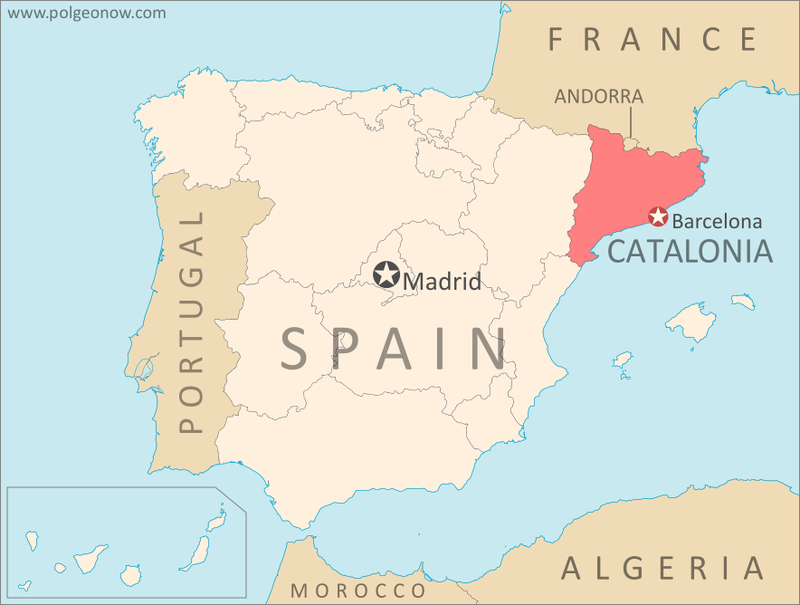 Many countries say they're neutral on the Catalan independence referendum, but none have committed to formally recognizing Catalonia as an independent country. Though it's hard to imagine in powerful Western Europe, there's a chance Catalonia might end up as isolated as Abkhazia or even Somaliland. 6. Can Catalonia stay in the EU? Another big issue hanging over Catalan independence is the region's European Union (EU) membership. Right now, all of Spain is part of the EU, including Catalonia. And as citizens of the UK know, leaving the EU is no simple matter, since member countries are heavily intertwined economically and in other ways. 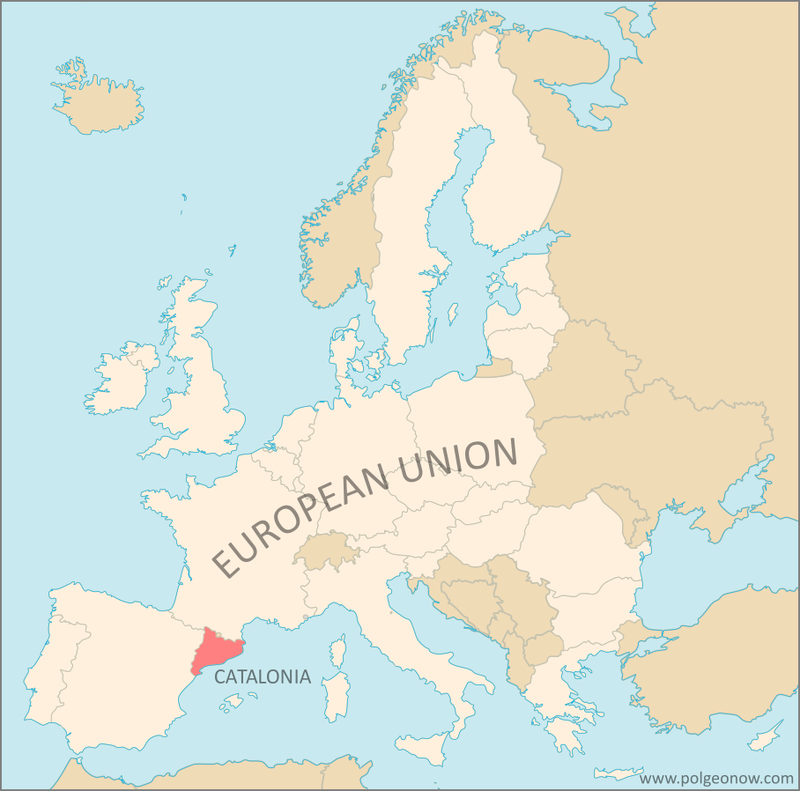 So here's the catch: For Catalonia, declaring independence probably means leaving the European Union: The EU says if Catalonia secedes from Spain, it will have to re-apply as a new member country. And since all existing EU members, including Spain, have to agree before a new applicant is accepted, it could take awhile for that to happen. The vote went forward, but was badly disrupted by Spanish police, and it won't be seen as a legitimate democratic election result by most observers. Catalonia's government says independence won with 90% of the vote and 42% voter turnout. The Catalan government missed its self-imposed 48-hour deadline to declare independence. PolGeoNow has published updated election results and voter turnout maps by region, based on official data released by the Catalan government. On October 10, Catalonia's leaders signed a document declaring independence from Spain, but "suspended" it so that it wouldn't take effect yet. October 13: Check out our new detailed, municipality-level maps of the official referendum results! On October 27, Catalonia's pro-independence administration declared full independence from Spain, and Spain's government began trying to assert direct rule over the region. Stay tuned to PolGeoNow and the PolGeoNow Twitter feed for more updates on Catalonia's independence vote, plus new developments around the Kurdistan referendum in Iraq. Click here to view all Referendum 2017 articles.